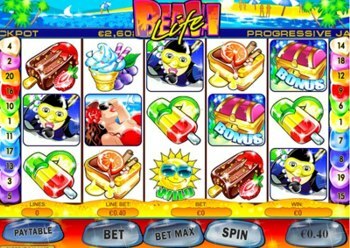 Beach Life is a $0.40 single coin video slot machine with 5 reels and 20 pay lines. The game offers all the Wild and Scatter opportunities, bonus feature round and big progressive jackpot. The jackpot is only available if you play maximum 20 coins or 8.00 credits per spin and hit 5 Wild Sun symbols. The Sun symbol is Wild and can win you the highest jackpot in the base game - progressive jackpot or 2,000 coins - second biggest jackpot in the game. The Sandcastles symbol is a Scatter that does not have to occur on a particular payline to pay. 2 or more of them anywhere on the game screen, bring you some extra wins up to 500x your total bet. 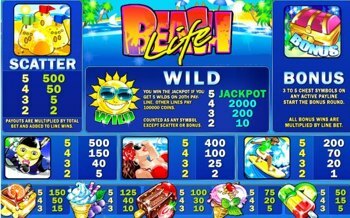 Beach Life Bonus Game: Hit 3 or more consecutive Bonus Chest symbols on activated payline, starting from the leftmost reel, to trigger the Bonus round. Choose as many cash prizes as you had bonus symbols in order to collect random cash prizes from the sea bottom. Progressive Jackpot: 3% of every bet by every person playing Beach Life in each of Playtech online casinos, is added to a common pot. When you hit 5 Sun symbols on the 20th payline, you win the entire Progressive Jackpot. After somebody hits a Jackpot, a new pot is started from the seed of 100,000 x coin size ($50.000.00 minimum). Despite of the "small" minimum the progressive jackpot grows very fast and quickly reaches millions of $ or Euro. Average hit is a bit over $1.2 Million. Beach Life is a popular progressive slot that generate winners every month with some of them hitting huge multi-million dollar jackpots. One of the large winner is Alain M of France who hit €1,812,934.00 jackpot on Beach Life while playing at Europa Casino on 21 March, 2009. Another winner, Sylvia P. from Canada won $4,188,719.98 on Beach Life Progressive slot at Joyland casino in August 2008. Use our SCORES and save your money! Copyright © Online-Jackpots.biz, 2002 - 2019.